Vertiginous Golf is unlikely to get a Nike endorsement for swoosh-emblazoned plus-fours anytime soon. 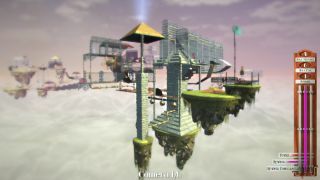 It's billed on Steam as "a dystopian steam punk mini golf adventure game set in the skies above an alternate world where life on the ground is enveloped in permanent smog, constant darkness and never-ending rain." We haven't reviewed it but our look at the Early Access release last year was quite positive, and I enjoyed the time I spent with it as well. And for the next 24 hours (although a bit less than that by now), it's free. Vertiginous Golf has about as much to do with golf as Trackmania has to do with Formula One, which is to say, not much at all. It's more of a puzzle game than anything else, as Shaun mentioned back in April, in which you will typically find yourself double (or triple) digits over par until you figure out exactly how to approach each hole. Then you'll spend more time working on your technique. "Get mad and quit" will probably come up now and then too. Hey, golf isn't for everybody. Fortunately, the whole "free" angle eliminates most of the concerns about which side of that particular ball-washer you fall on. Maybe you end up with a game that makes you ragequit after 30 seconds, or maybe you get one that keeps you focused and challenged for hours on end. You might even fall somewhere in between! IndieGameBundles says the Vertiginous Golf freebie will come to an end at 10 am PT on October 27—and to clarify, if you grab it prior to then, it's yours to keep. The Vertiginous Golf Gold Pack, which includes customization options for your avatar, hummingbird, and clubs, as well as special "gold" surfaces, metal, and statues to use in the Course Creator, is also on sale right now for half-off the regular $15/£11 price.